The Kampa Comfort Firenze Chair is designed as a versatile and supportive chair for all outdoor events. For those requiring a more traditional classically styled chair the Kampa Comfort offers a well designed reclining mechanism for comfort and relaxation. 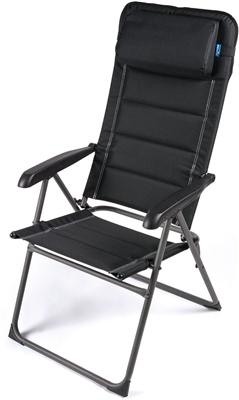 The strong steel frame provides strength to support up to 150Kg, whilst keeping the chair relatively lightweight at just 5.2Kg - ideal for transporting in a caravan or in the boot. Chair seems very well made and is quite comfortable. It is a little difficult to open first time round but does pack up fairly flat.